Celebrate the much-anticipated arrival of a newborn baby, by treating your new parents to something really special with our luxury baby hampers! Filled to bursting with designer baby gifts, this luxury baby hampers selection is sure to be a real hit. 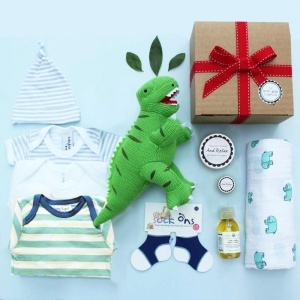 Ideal for baby boys or baby girls, our luxury baby hampers contain baby clothes suitable for 0-3 months of age, baby swaddle blankets, baby bibs and hats, not to mention luxury aromatherapy bath time treats for mum. Added to that the cheeky little faces of our Lamaze Captain Calamari and Freddy the Firefly when you open the gift box, ones of these sent to your loved ones, can't help but put a smile on their face! 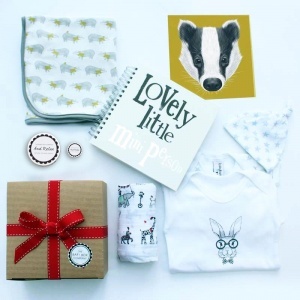 Have one of our beautiful luxury baby hampers delivered to your new parents in the UK or around the world.